Understanding macros will give you the power and freedom to really give your body what it needs and also help you feel satisfied along the way. Because if you’re miserable trying to achieve your fitness and nutrition goals, then you’re doing it wrong! As women, we have unique nutritional needs. And because we know that women play hard and never quit, we created IdealLean protein. 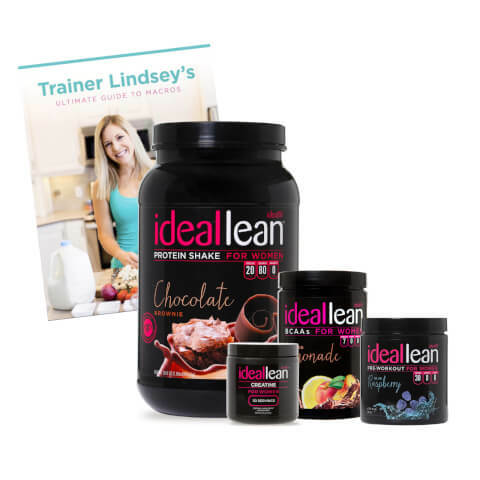 Get ready to get lean! To get the best results, you need to work out hard and smart. IdealLean Pre-Workout packs ingredients that maximize both the mental and physical aspects of training, so you can unlock your full potential and have the best training experience possible. The Energy and Focus Blend will help support your mood and concentration during your training, and the Endurance and Blood Flow Blend will allow you to push yourself even further towards your ideal body. I bought this package not really knowing if I’d like it or not. I have tried several other proteins before and have not enjoyed drinking any of them! This protein tastes better than the rest! I recently started working out again, and was looking for something to get me started, and I wanted to try some of the different products! This stack fit the bill, and I have enjoyed all of the products! I will definitely be buying again when I run out!